Back in time, during the Sengoku period, Japan was in constant conflict; Lord Daigo Kagemitsu lost his fate. He decided to make a pact with 12 demons, offering them anything to stop the famine and crisis of his land. This allowed them to roam free and commit atrocities along the countryside. Years later, as the region economy begins to thrive, Daigo and his wife Oku are expecting their first son, however, that day became collection day for the demons. The newborn child had no eyes, skin nor limbs. Immediately, Daigo understood his fate and ordered his death, however, the baby’s will to live was stronger and with help from Jukai, a medicine man who used healing magic and alchemical methods, the child was able to survive. Sixteen years later, the endless war continues, and Jukai is recognized for giving prosthetics to the death to mourn for them. However, for him it is just a way to use his prototypes. 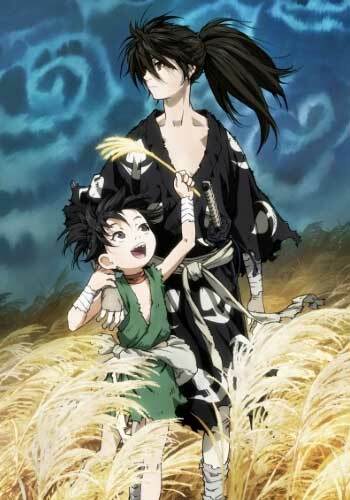 Meanwhile, in a distant town, we meet Dororo, a young thief who offers quality goods from the capital. He was hired to look after them, and instead, he tried to run away. As Dororo is severely punished, Hyakkimaru appears out of nowhere; and subsequently, a demon from the river and begins to devour everybody. Before Dororo is killed, Hyakkimaru slays a demon. Dororo is astonished to see his prosthetic arms turned into a weapon, even more, once he realizes Hyakkimaru cannot see or hear. However, for some reason, the clouds begin to gather and thunder, Hyakkimaru’s mask falls down and his face begins to cover with skin. From afar, Daigo and Oku seems to understand the meaning behind that hideous storm. A manga series from Tezuka Osamu in the late 1960s. A classic anime series based on the manga aired in 1969. A new anime adaptation by MAPPA and Tezuka Productions premiered on January 7, 2019.